The following is taken from a transcript from the Richard Thompson spotlight panel at Heroes Con 2010 in early June. As we discuss briefly in the interview, Thompson and I had spoken at the convention two years previous in a room the size of Madison Square Garden that maybe had a dozen people in it. This conversation had a slightly bigger audience and a much more appropriate setting. One thing I noticed about the audience is that -- as is the case with a lot of Heroes Con panels -- they looked like they really wanted to be there and were taking great pleasure in hearing what Thompson had to say. No one was grinding through the day or sitting down for a spell or facilitating an assignment for a new site. It also seemed to me that Thompson's popular with his fellow cartoonists. More than a few came up from exhibiting on the floor of the show to see his panel, which I find to be a rare thing. There was even a cartoonist participating in the panel next door that kept sneaking over to sit in. Thompson's daily Cul De Sac continues to be a joy. I was as happy as anyone to be in that room to talk to him about it. Note: There were a pair of recordings made of this session; this one was made available to me by Mike Rhode, whom you should bookmark right now and visit a bunch. It was edited sharply for clarity and flow. TOM SPURGEON: Thank you all for coming out. This is the Richard Thompson spotlight panel. My name is Tom. The gentleman to my right is Richard Thompson, I think the great American strip cartoonist working right now. 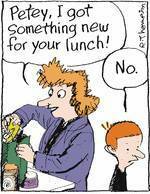 RICHARD THOMPSON: Bless your heart. SPURGEON: It was my pleasure to talk to Richard two years ago at this same show when we were in a gigantic room with about a third as many people. [laughter] I think we're both happy to see so many people out on such a busy day with so many great panels competing for your attention. I think we'll enjoy the room size a bit more than 2008's echo chamber. THOMPSON: The echo is much closer. SPURGEON: In fact, I don't know if you remember, but there was a gentleman who came in who basically decided that he needed to announce to us that he was just there and he had no idea who you were. SPURGEON: Richard, you just came back from the NCS weekend. You were up for the Reuben Award this year, for Outstanding Cartoonist of the Year: the big prize. Were you surprised when that announcement was made, that you were one of the three finalists? THOMPSON: I was entirely shocked, yeah. I'm not a member of the NCS and I feel I'm not in the mix somehow. The guy who won, Dan Piraro, has been nominated eight or nine times. And so it was not a shock to him, I'm sure. Stephan Pastis, who was the other one, had been nominated once at least. It took me about two minutes to go, "Oh. OH! Oh." It was one of those conversations where you finally hang up and go, "Oh, that's what that was about. Oh. Gee." SPURGEON: You know it's entirely possible that he wanted to hand-deliver the news but got lost on the way over to your house. THOMPSON: I told my friend Mike [Rhode] about it and he leaked it out. The way it works for the NCS with the Reuben is that the nominations are all open. It's just by vote. Everyone votes on who they think. They put in three names; the top three of all those votes become the nominees. SPURGEON: Were you surprised in that you're still very early on in the lifetime of your strip? THOMPSON: The syndicated strip is not even three years old. So for that and being not a member and I just don't follow the group as closely as I should. You think of someone like... Watterson won it twice. Walt Kelly won it. Schulz won it. Everybody. The list of people going back, it's got a pedigree, you know. SPURGEON: This wasn't the first time you've gone to the national meeting where they hold the awards ceremony. THOMPSON: It was the third time I'd been to the Reubens. SPURGEON: Is it different when you go as one of the three potential Kings of Comics? THOMPSON: They have divisions, too. I've been a division nominee a couple of times before, but as one of the three guys it was slightly... more, I think. THOMPSON: He wasn't. Dan Piraro. Stephan was. It's very much an old boys' club in some ways. They have a black tie dinner for the awards. Black tie strongly suggested for the awards. It's in a fancy hotel. The history of this is they don't tell people where it's going to be because back in the '40s and '50s they were afraid fans would find this out and they would mob the place. [laughter] Like, "Oh my God, all the cartoonists are in this one spot." Like they were going to stand in front of the hotel with signs and pound on the doors like the Oscars. That doesn't happen. They keep waiting for it. THOMPSON: [laughs] Burn the place down! SPURGEON: -- for the open slots. Is there a general answer if I ask you how the strip is doing? SPURGEON: Is it a steady gainer? I think maybe two years ago we were talking 125 or so. THOMPSON: It's gained some overseas. It's probably lost some. I get a statement every month I stopped looking at. It lists all the newspapers. Good health is all a strip can hope for these days. SPURGEON: One of the astonishing things about the current newspaper crisis is that comics were suddenly on the table. SPURGEON: It was kind of a sacred cow that was not touched, even in previous dark times for papers. This time it's seemed like everything's up for grabs. THOMPSON: Everything's falling to the axe, yeah. Some papers dropped whole pages. Some -- was it the Denver Post? -- dropped 20 strips or something. I think among them mine. They kept all the old ones. They kept Peanuts and all the older ones and dropped most of the new ones. Several papers have dropped like a page's worth of comics. Or condensed them. I think the Washington Post dropped a few and condensed from three pages down to two. Newspaper editors hate to touch the comics. They know they'll get blowback. None of them want to pay too much attention to it. There are a few papers where the editors care about it. SPURGEON: One thing more and more common now is where the editor kind of pushes these decisions off on the readership. There's a poll, or various try-out strips. How do you tend to do in a try-out situation? THOMPSON: As a new strip usually awfully, because anything new, it stinks to high heaven. Every reader that sees it for the first time is like, "I don't like this." It's not Beetle Bailey, it's not Peanuts. It's not Cathy. It's not Stephan Pastis, who's doing as well as anybody can do. Any strip takes an amount of time to build familiarity, for people to identify with it and to like it. The early blowback from ones that ran polls was "We hate this. The drawings are shaky. The lettering looks weird and the words are too long. They talk too much." They hated it. Every once in a while someone would say, "I kind of like it." If editors really paid attention to these polls, they would kill everything. [laughter] We're lucky we survived. SPURGEON: You're three years in now. THOMPSON: Yeah, which is somewhat safer. SPURGEON: Has that changed the way you do the strip at all? I know that with strips that are very young, that are in that first couple of years, syndicates can be insistent on making sure every strip explains itself and that every strip works if it's the first strip that people see because the first couple of years almost every strip is the first strip that someone out there sees. Over time you're allowed to get away from that, and make jokes based on an understanding of the characters. THOMPSON: You can assume some familiarity. SPURGEON: Are you at that stage now? THOMPSON: Sort of. You have to have so much exposition for a joke sometimes. You always want to have the characters identified. "Hello, Alice." "Hello, Petey." Something like that. But at a certain point you can assume some familiarity that this character is this way. She's a little fireball; he's a reticent kind of hesitant wallflower. People sort of know who you're talking about. They know that this kid with the spiky hair is kind of a mooncalf. At the same time you have to put a little exposition in, which is okay with a kid strip, because kids are always saying, "So what are we doing?" "Where are we going?" "Mom, what's going on?" You can kind of depend on that a little bit. At the same time you can relax and hope that people know who you're talking about. SPURGEON: I hate to paint the picture of you spending your free moments looking at old work, but there's a space now between when the strip started and where the strip is today. Can you tell the difference? Are there differences in the characterizations? THOMPSON: Yeah. The shape of Petey's head is a little bit different. [laughter] A little bit more bulbous. I can look back and see, I mean, the drawings are a little bit less scratchy, not as feeble-looking, I hope. Someone pointed out that I've sort of narrowed it down in some ways to certain locations that repeat over and over again just because they work well. It sort of sets it up quite easily without the exposition. I look back and think if I had to re-do this I would probably change things. You can play around with certain things, like I don't want to identify certain relationships too early -- let them kind of grow naturally and mix it up a little bit differently. It has changed. I can see where I would change things even more now. Think five years down the line, maybe. SPURGEON: Are you more conscious of expanding the cast? Bringing in more voices? SPURGEON: That's another thing they let you do, encourage you to do, at a certain point. THOMPSON: And they do. They like it. One editor I had for years loved Ernesto whenever he would show up. Little strange boy with a vocabulary. He might be imaginary. He's kind of frightening. He's sort of a James Bond villain in embryo. [laughter] "Any time you want to bring him back, just bring him back. He's fun." They like to expand it, within reason. SPURGEON: How much communication is there with the syndicate as opposed to maybe at the beginning? Do you still seek out advice? 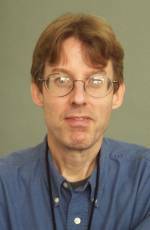 THOMPSON: My one editor for years left recently. They said, "If you don't want to use an editor, if you want to just send stuff in, that's fine." But I told them I liked it. I send in a really crude rough, pretty much a stick-figure rough. I pay more attention to the language and the pacing, stuff like that, with just enough identifiable going on. I kind of like having that first audience, that first set of ears and eyeballs looking at it just to make sure. I can usually tell if I'm being not funny. But I can't always tell when I'm being incoherent. "Does this make sense?" is what I'm trying to say. I like that. And they said, "Fine." They've been very easy. Pretty much every time it's like, "Yes, go with this. Yes." Maybe "Change this slightly," or "It's obvious he's speaking to her," or something like that. "Maybe make this less cruel." It's been very easy. SPURGEON: Are you more comfortable with the routine? I remember when we talked two years ago you were one year in, which is where a lot of burnout sets in when they're first doing a strip. Now that you're even further along, has it become easier for you? Are you happy with the routine of it? SPURGEON: They let you go until two weeks before publication? THOMPSON: Oh, yeah. It's terrible. It's been closer than that sometimes. It's a month on Sundays. SPURGEON: That reminds me of the losing pitcher they talk about in baseball, that if you're a pitcher with a record of 4-20, you must be awfully good if they're still willing to put you out there. So in a way, they must be really confident in you to let you run at two weeks ahead of publication. THOMPSON: Well, the bad ones are me and Bill Amend who does Fox Trot. SPURGEON: Wait. He's only doing the Sundays now. THOMPSON: He's only doing the Sundays but he's still behind. He's gotten even worse. [laughter] I saw him last weekend and he said he just barely got it in. I thought, "You're only doing one drawing a week. It's not that hard." And then Doonesbury, whose whole career is built on being right on top of the news somehow. Two weeks is luxurious for him. He's like a week and a half, maybe. SPURGEON: We need to come up with some sort of Doonesbury-style dispensation for you. THOMPSON: My editor at one point said, "You kind of need this pressure, don't you? This kind of terror just to produce?" And I said, "Yeah." Boondocks was another one, I think. He dealt with Boondocks, too. I guess they give him the hard cases. I can look back at old ones and think, "I can do this with it now. I can rethink this idea. I can play with this more. I can bring this guy in here." It seems to have spread out in front of me. I don't feel that kind of burnout so much. SPURGEON: So the writing of it goes a little more smoothly. THOMPSON: Yeah. I can sit down in two hours and do two weeks' worth of writing, pretty much. Sometimes. Not always, but when I start rolling, it happens. It still takes me like three or four hours a strip to draw. Maybe two hours, sometimes, if I just have talking heads going. SPURGEON: I was thinking about the differences in your presence here at the show this year. An obvious one is when you came two years ago you had the dailies and the Sundays. [to audience] If you get the chance to visit Richard and see his originals, they're lovely. Especially in a day when a lot of people scan stuff in and you end up buying strips that have weird panel fixes sticking out and word balloons in the margin. THOMPSON: I've done a few of those. SPURGEON: So your originals are beautiful. But this year you also have some merchandise. [Thompson laughs] Is that fun for you to re-present the strip and your art that way? You have to do that. You have to think about that. I asked the syndicate and they said, "Whatever you think of, go for it. Do your best." And my wife is good at that. More than I am. Go for it. The syndicate has and agreement with Zazzle, which is like Cafe Press -- maybe slightly more than Cafe Press in that they do more stuff. Each strip on Gocomics you can click on the Zazzle link and get that strip on a mug. Or a t-shirt. Or a mousepad or whatever . I don't know how much they really do, but they're aware of that market, too. Which helps. SPURGEON: So you don't mind seeing that stuff? THOMPSON: Not too much. I'm not as pure-minded as Bill Watterson was. SPURGEON: Let me ask you about your books, the Cul-De-Sac collections. Another way you're precocious -- in addition to Reuben Award nominations -- is that you not only have one book series but you already have two different formats when it comes to book publication. How has that gone for you? Are you reaching a different readership with the different books? THOMPSON: The second has just come out now. Andrews McMeel is the publishing arm of my syndicate. Andrews McMeel pretty much has all the comics reprints for all the syndicates. They do Doonesbury, they do the big Calvin and Hobbes. They also do Pearls Before Swine and some of the other ones: Sherman's Lagoon, I think. They do the reprints of a year's strips. Every Fall for my strip. Now that I've had two of those over the last two year, they also have a treasury, which is the last two books in one. Which is kind of a rip-off. At the same time they said, "Why don't you do some more commentary in this to make it less of a rip-off?" SPURGEON: Did they put it to you like that? THOMPSON: You understand what they mean. Watterson, when they were doing his, each one he would give it this kind of sarcastic title like The Very Necessary Calvin and Hobbes, just to make it obvious. He eventually told them to stop doing that, I think, at some point, to only re-sell the strip in so many ways. Then they came out with the 20-pound, 50-pound everything Calvin and Hobbes and that did just fine. And he had already retired. So the treasury is coming out next month, which is the last two books in one, with author commentary like a DVD director's cut kind of thing. SPURGEON: How do you like to read strips? Are you a book guy? Do you prefer to read them in the newspaper? THOMPSON: I like everything. I like the newspaper. I'll do on-line -- but only for a few of them. Dave Coverly, who draws Speed Bump, told me he doesn't read strips anymore. If it's bad then he feels bad for the guy who drew it, and if it's good he feels bad for himself. [laughter] I know the feeling. You can get so distracted by other people's strips. You're kind of sick of reading your own. So I usually have to go back in clumps and read these things. I don't read as many in a daily format as I would have. Twenty years ago I read every strip in the paper, every strip over three pages in the Washington Post in a very definite order, ending with Calvin and Hobbes. I saved it. I started with ones I didn't like, which I won't mention. Not so much anymore, I guess. SPURGEON: Do you get more feedback, do you think, from audience members now? You're available. You have a blog. You have e-mail. People can talk to you. Do you find people get a hold of you now? SPURGEON: What is the nature of their conversations with you? Do they tell you they like the strip? Do they suggest improvements? [Thompson laughs] Do they ask you how they can become syndicated? How would you describe your relationship to readers and fans? THOMPSON: It usually comes from out of the blue. On my blog, I've got my e-mail available through my "complete profile." So it's a little bit hidden, but it's available. It's nice to get e-mail because you can delete it or you can respond or whatever. Usually they are very, very nice. Some of them are like, "I like this one because..." or "I identify with this." Or "This is like my daughter." Comics has always gotten this, "You must be watching my house because these are my kids" kind of thing. Or from a teacher saying, "This is my daily life: these kids with their ADD and conversations that fly every which way and their randomness." Sometimes it's other cartoonists. Usually they're very nice and pleasant. I've only gotten a couple of complaints. People have misread a strip entirely. THOMPSON: One of them read a strip early on, she thought I had Alice urinate on the sofa by accident. [laughter] I said, "That is not what happened. If you read the third panel carefully, she falls off the sofa." And the person was like, "Oh, I'm sorry. I guess I should have read that more carefully." You can't really do that on a Sunday strip. That didn't happen. But mostly very nice. And sometimes someone -- Cul-De-Sac runs in an Italian magazine called Linus, which has been around for years and years. SPURGEON: Linus is an important historical repository for American strips in Italy. THOMPSON: They pay very careful attention to how they translate it. I talk to my translator fairly often. He's Italian. He's also a letterer and a cartoonist himself, so he pays close attention to presentation. Linus has a pedigree like you were saying. They run Doonesbury. I think the one translating Doonesbury was a cartoonist, he was covering the Afghan war and he was killed over there. SPURGEON: That is true; I remember that story. THOMPSON: I forget his name now. In Italy they don't run strips in the newspapers like they do over here. They're presented in magazine form, so the audience for strips has to get it through this magazine. I think there are a couple of other countries, too, with a similar set-up. The book just came out in France. So I'm hearing from over there. There was a Finnish cartoonist at the Reubens last weekend who walked up and said he had a copy of the book in Finnish. "Have you seen one of these?" in a very Finnish accent. He had very good English. Turned out he went to Kent State in Ohio. SPURGEON: Is there anything specifically American about the strip that doesn't translate? Maybe even the idea of a cul-de-sac? Is there anything people are confused by? THOMPSON: Not too much. I thought some things would more than others. My translator in Italian has asked me some specific things like, "What does this mean?" I had some baby talk: umagawa or something like that. "Is this a word?" [Spurgeon laughs] "It is not." Most of it seems to translate okay. Nothing has been too off the wall. I think they're more aware of Americanisms than we would be Italianisms, I suppose. I guess it's universal enough. So far so good. SPURGEON: I don't want to spend the whole time talking, and we have such an intimate group I'd love to hear any questions anyone has. Yes, sir. AUDIENCE MEMBER: I absolutely love Alice. I would like to know if she has any basis in a real person you might have known at some point. THOMPSON: Quite a few people, really. I try not to take any one character specifically from real life so that a person can point to a character and say, "That was me." I have two daughters who are now almost 12 and almost 15. They both have some of that. I figured out early on when I was trying to think -- the strip started in the Washington Post magazine. The editor there said, "Would you like to do a strip about Washington, D.C., but just about the people who live there, not about Washington as the capital of the free world?" Early on I couldn't get away from the idea of a family. All I could think was, "A family living in the suburbs. Another strip about that. What a unique idea for a comic strip." [laughter] Early on I figured out what the kids were like. The little girl, she was a fireball, she was the irresistible force. Petey was kind of like this little inbred, this ingrown personality, the immovable object. The friction would be these two [slams hands together] colliding all the time. Alice was, I kept thinking, was parts of one of my daughters and a lot from my father-in-law, which I don't want to tell him. It would probably crack him up at the same time, but I don't want to tell him about it. Kind of overbearing, kind of self-absorbed as a four-year-old can be. Petey is the worst of me in so many ways. [laughter] The kid who wants to sit on his bed. He wants cartoons, but his interest is more in Chris Ware than it would be in Rob Liefeld. If that makes sense. His tastes are more grim somehow. Each one is a group of people. Ernesto is sort of a kid I knew in the third, fourth and firth grade who was kind of a scary little kid. He was kind of your friend but also kind of not your friend. Depending on the day. There was a friend of my brother's who was this little kid who was kind of an empire-builder within his own mind. It's like everybody is like five or six people combined into one, which is somewhat more interesting than just being one person. That answers more than your question asked. SPURGEON: The design for Alice is wonderful. Was there any pressure to make her more traditionally pretty? THOMPSON: No. It took me a while. I was looking at some old sketches of her and she was kind of... she's not cute, but she's not... she's... she's approachable enough. [Spurgeon laughs] Stephan Pastis said what he liked about her is she hasn't realized she's not cute yet. It's not clear that she's not adorable. At a certain age she might look at herself and say, "Oh my God, my nose... my hair is ratty-looking!" It might hit her in her pre-teens at some point. Petey probably just doesn't care. He's probably not looked in a mirror in five years. No, they haven't, which I'm thankful for. SPURGEON: Does anyone else have a question? Yes. AUDIENCE MEMBER: Why did you decide to have the characters be pre-schoolers? Is there something about pre-schoolers you liked? THOMPSON: My daughters were in pre-school. I remember one day in particular. My daughter was four maybe, and my younger daughter was one. My wife was taking me to the train station, I was going up to New York for a weekend. This is back ten years ago or something like that. The kids were running around loose, it was kind of a frantic day for everyone. I was there for like 15 minutes and there was one mom dropping off her daughter. She was like a single mom with her daughter and she could not handle her daughter too well. They had this hamster ball thing, where the hamster could roll in this ball. The kid was chasing it around. The mother picked it up and said, "Oh my God, it's alive!" and dropped it. [laughter] It was like, "I gotta go to work, get me out of here!" I looked around and there was all this action and nothing was meshing at all. Have you ever seen that movie Gregory's Girl? It's a Scottish movie set in a high school back in the early '80s, I suppose. The one who made it also made a wonderful movie called Local Hero. This random series of events makes up this whole movie. He said he went to a high school at some point and just stood around watching and realized the surrealism of this, these little snippets of life would go past that you couldn't quite follow. In the movie there's this person in a penguin costume. He keeps showing up and they keep saying, "No, you're in room 5A." The kid keeps wandering through the movie and people keep misdirecting him. I thought, "That would make a good strip because all these people, their lives barely connect. Their lives are this circle and this circle and this circle and they kind of bump together." Like a Venn diagram I guess, but they meet like [motions] this much. You can have all this fun walking from one reality to the next. There's one Sunday with Alice, where Alice and her dad, who don't quite mesh together too well, her dad seems logical and somewhat reserved like Petey and Alice is just like this random ball of energy. In each panel Alice has a different costume, she has a potato chip bag on her head in one, a flour pot and a wagon, she's got a bunch of dolls and a tutu, each one is different. Her dad sees her in each, every two minutes maybe, and he says to his wife, something like, "My life and Alice's don't meet at all." That's the whole strip in a nutshell. THOMPSON: Exactly. And Alice says to Petey, "Daddy's always staring at me and giving me the creeps." And Petey says, "If he made more money and we had a bigger house, this wouldn't happen." [laughter] They'd be completely away from each other. That's my family in a nutshell, too. SPURGEON: I like that secondary theme where there's this giant disconnect, particularly between the children and their parents. SPURGEON: Typically, they'd want you to go in the other direction. THOMPSON: They want the warm and the fuzzy. They want the hugs. You realize in your family there's this level of, it's like you and your wife maybe, and then your children. I've told you this before, but I walked around the neighborhood with my daughter when she was like four or five. I was watching her and what she was interested in. She was interested in like this pile of dirt, in this stick. I kept thinking when I was that age I knew all the faucets you could drink out of at someone's house or the bush you could play under. I have no clue now as to where these spots in my neighborhood are. [laughter] You realize that the levels of experience are so different. You can write a strip quite easily around that. This person comes in and this person comes in and each one has different level of experience and you hope by the end something funny happens. That's a strip right there. SPURGEON: Any other questions? We have plenty of time. AUDIENCE MEMBER: One thing that really surprised me that felt like a turning point in the strip -- it may not have felt as such to you -- is the one where Alice keeps calling Dil the new kid. Two or three strips in a row. It did something that you don't really see much in strips which is unintentional meanness. THOMPSON: Yeah, she's kind of a bully. AUDIENCE MEMBER: I think most kids are at some point or another, whether they're trying to be or not, when they're that young. I thought that was really interesting, your playing up that aspect of things as well. THOMPSON: Uh-huh. Especially with a kid like Alice, who is kind of self-absorbed, she's not aware of other people except as extensions of her own reality. She tends to be a force of her own, and is going to yank people around some. Dil is such a patsy. She's just having a bad day. She's pretending not to recognize him and is really picking on him. It's kind of fun to write. Stephan Pastis says the character he likes to write is his rat, which is such a mean little character, nothing good about him. You can do more with a villain that you can with a hero. Alice is nobody's hero, really. [laughter] She's a bully sometimes. 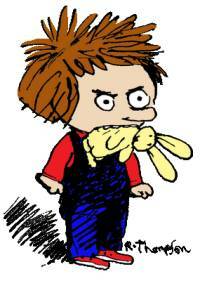 SPURGEON: I think it's true with Schulz that when Lucy kind of locked in as a character the strip crackled. SPURGEON: There's an obvious subject that people have been asking me about. You made an announcement about your health last year. I wondered first, "How is your health?" and second what it was like bringing that health concern public. I'll let you characterize the whole thing, because I'm afraid I'll use a wrong term. I'd had for the last couple of years this weird sort of series of shakiness and clumsiness. I eventually, finally, two weeks maybe before San Diego, found out I have Parkinson's. My right hand's good. That's the money hand, I guess. They say it takes a year for the drugs to really kick in, to get to the level of treatment, and I'm there now. There was a year of kind of ignoring symptoms before that. It turns out this is the sort of thing that goes back years and years. One of the symptoms is what they call active dreaming, which is whatever you're dreaming you start acting it out. My wife said, "Oh, God, he's been doing that forever." He howls at the moon and kicks all the covers off. The embarrassing story I'll tell you is from about ten years ago with the shoebomber: 2002, I guess. I had this dream sometime after where I was in this Safeway or grocery store. I had a basket of food. It was one of those specific dreams where every detail is just right. You wake up and you remember every bit of it. I was carrying a basket of groceries into the 15 items or less aisle, and I realized the guy ahead of me was the shoebomber! "There he is. Let's get him!" [laughter] I start whaling on this guy. I was pounding on him. SPURGEON: Have people been generally supportive? THOMPSON: Very, very supportive. Very much so. I told my family. I told my editors at Universal Press. "I've got some news for you. I'll e-mail you in ten minutes." They said, "Uh-oh. What's going on?" I said this is what it is. It won't affect my drawing. They said, "Whatever we can do, just let us know. Take a few weeks off, take off what time you need to." They took over the culling of the strip. They've been supportive, which I've been grateful for. So that's the story. It's been my excuse for a lot of other things, too. SPURGEON: I wanted to revisit something. We mentioned straight away that you've just came back from the Reubens. How was the general mood given the state of the newspaper industry? Are people positive? Is the mood as negative as it was a couple of years ago? THOMPSON: It was a lot of people saying, "What's next? What do you think?" Nobody knows quite what's going on. The NCS, one of their rules for membership -- as I said, I'm not a member -- is that a certain percentage of your income has to come from cartooning. Which shuts out a lot of indy cartoonists and web cartoonists. The debate is whether to let them in. I think what they need is new blood, new thinking and stuff like that. A lot of it is like an old boys' club. A lot of them are very established with a thousand papers or more. Like Mort Walker and Mel Lazarus. I like them. They're wonderful people. Funny people. Jeff Keane is one of the funniest people I've ever met. SPURGEON: His father is one of the all-time funniest guys to talk to. All those guys are funny and interesting guys. THOMPSON: They've been doing this all their lives. My God, they were there at the beginning. They have the stories. Arnold Roth was there; he's a walking party. He kind of shows up everywhere, I think, everywhere there's something going on. The mood among the younger ones was more cringey than the older ones, I'm sure. A lot of the syndicates were there, the heads of those. None of them quite know what's going to happen next. Shaenon Garrity was there, and she wrote that lovely piece last year, a very elegiac piece about last call maybe coming for the old boys' drinking club. The whole milieu: black tie is not going to happen among indy cartoonists and web cartoonists, I'm sure. A lot of it was a party atmosphere because this is the time they all relax, but the undercurrent was one of worry, I'm sure. SPURGEON: Another thing I wanted to revisit and ask you about: we've mentioned you have an on-line presence and that you've been doing that. The actual blogging you do, is that satisfying for you? SPURGEON: It can't just be publicity-related or about getting your name out there, not at this point. THOMPSON: It was sort of by accident. I was leaving comments on some friends' blogs and they said, "Start your own. It's fun, it's easy. You push like three buttons and there you are with a blog." I learned to use a scanner. My wife said, "Don't do anything that Bill Watterson wouldn't do." [Spurgeon laughs] I can't imagine Bill Watterson starting a blog. [laughter] Maybe he has one and nobody ever reads it. Maybe that's the way he wants it. Because it's not actually on the web. It's fun because it's a way to connect with people. I put some really nerdy stuff up about pen nibs, stuff I can go on forever about. I received a lot of nice comments when I posted about having Parkinson's, people saying "Good for you" and "Power to you" and "You should do this." You hear from a lot of people just incidentally because of it. It's just another connection. People say, "I read your blog." Neighbors and friends that I would not normally expect to. SPURGEON: One nice thing about your on-line presence is that you put up a lot of older work up for discussion or to recontextualize it. When Cul-De-Sac came out, a lot of comics people were shocked to learn you weren't some 25 year old but a longtime working cartoonist and caricaturist -- one with whom a lot of us weren't deeply familiar. So we get all this value-added comics work by following you on-line. Do people react well to see this range of work? THOMPSON: Yeah. I've been freelancing for 25, 30 years. It's a way to put up old stuff that otherwise has no reason for existing. 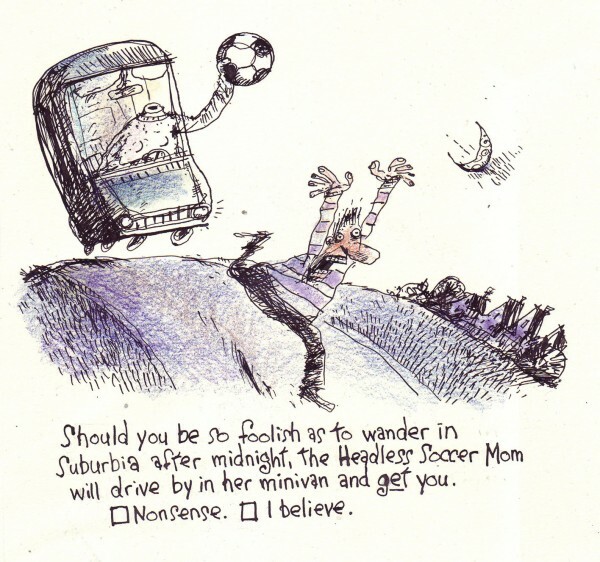 Sometimes it's a spot drawing from The New Yorker 15 years ago or something like that. I have, like I said, piles of this stuff, and some of it is stuff I'm really happy with. I'm giving it like a second life. It's pretty late in the career to be starting a syndicated strip. It started the week before I turned 50. The syndication started. After years of swearing I would never do a syndicated strip, suddenly I find myself with this thing and it's more fun than I thought it might be. SPURGEON: Has anyone ever commented on that, or met you expecting a younger cartoonist? THOMPSON: [pause] Yeah. [Spurgeon laughs] Which is kind of nice. "You're older than I thought." [laughter] They never say it, but you can see it. SPURGEON: Reading a bunch of recent strips, I was wondering if the parents have come more in focus for you as characters? SPURGEON: What's been the key to grasping onto those characters -- especially the mom? It seems like you have a hold on them that you didn't maybe before when the strip started. THOMPSON: The kids are easier to draw and to fit into the panels, so you see them more often. [Spurgeon laughs] It's true, it's like they're made for a comic strip. They're good enough parents, but not great parents. They're one step ahead of the kids, which is the way it goes. The dad is clumsy and reserved. The kids are way past him in some ways I'm sure. The mom is a little embarrassing and loud -- one of those moms who's a little too much fun. Too much fun for Petey for sure. [laughter] She's got a loud laugh, and gets very emotional about things. There's that one with some Halloween thing and she's dressed up like a witch. She's like, "Where's the next kid I can fatten up with some candy?" And both Petey and Alice are like "Oh my God, it's Mom again." I had a mom who loved kids and was very outgoing and happy and everything. My dad was more reserved, and still is. I kind of exaggerate those things in some ways. The mom wears loud clothing and if they're doing something cute she's like, "Oh my God! They're doing something cute!" The kid immediately freezes up -- which a kid would do. If you find yourself doing something cute, you don't want to do it again. They're still on the sidelines, but when they interact, I know what they're going to do. SPURGEON: One thing we talked about two years as you were locked into your strip is you wondered if you wouldn't miss the more varied aspects of your career up to that time. Is there anything you feel you're missing out on, or that you'd love to fold back into what you do? THOMPSON: There's some things I wish I could do. I quit doing [Richard's Poor] Almanac about six months ago. I just put it on hiatus. I got so far behind on the daily strip. I was turning the Almanac on Friday for Saturday. That was something they let me do whenever I wanted to do it, with no editing. It was like a dream job. I didn't want to completely drop it, so I told the editor it was just too much right now. She said take a hiatus and come back when you can and keep in touch. So they're great with that. I miss doing that. I do some freelancing. I did a piece for The New Yorker that's in this week's issue, I guess. It was due the week before I went off to the Reubens. It was a double caricature. It was one of those that started off very easy. The art director who is a sweetheart said, "This is great. Let's just go with the sketch." So I did the drawing, I did the watercolor off the sketch and she said, "Uh... I spoke too soon." The editor had come in. One of them was a caricature of... Tom Campbell and Carly... Feffiola? THOMPSON: Fiorina. Thank you. You know your government stuff. They're both running for the Republican nomination of Senate in California. Carly Fiorina has been fighting cancer. So they're saying, "This caricature is a little harsh. Can you make it a little more gentle?" So I did another face and Photoshopped it. They said, "Not quite." So I did another one, which by that time was pretty much a portrait and Photoshopped it on and told them it was going to look like one of those cardboard cut-outs where you put your face through. [laughter] I haven't looked at the magazine, but it looks okay, I think. So that was my recent freelancing. SPURGEON: Do you foresee a return to the Almanac? THOMPSON: I want to. When I get things under control, which is any day now. [laughter] It'll happen. I keep in touch with the editor and she says, "When you can." So they're open for it. I do miss some of the caricature work. Although it can be a nightmare, too. I used to do a lot of spot drawing, like in the back of The Smithsonian. That got dropped to the wayside. They switched art directors. These kinds of things come and go. The thing about the strip is I can think about it much more easily. When I switch gears now it's a little harder each time. I miss it but at the same time I don't miss it too much. The income was nice. 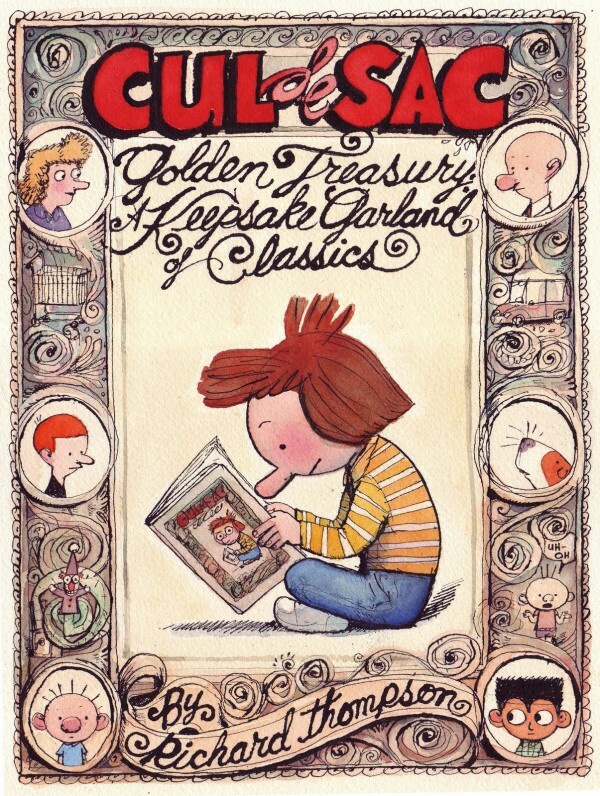 * Cul de Sac Golden Treasury: A Keepsake Garland of Classics, Richard Thompson, Andrews McMeel, softcover, 9780740791529, July 2010, $16.99. * This Exit: A Cul De Sac Collection, Richard Thompson, Andrews McMeel, softcover, 9780740776519, September 2008, $12.99. * Children At Play: A Cul De Sac Collection, Richard Thompson, Andrews McMeel, 9780740789878, October 2009, $12.99.